Fall is my favorite season and it is the season that I start doing some serious baking. These cookies are perfect for gifts and holiday occasions. 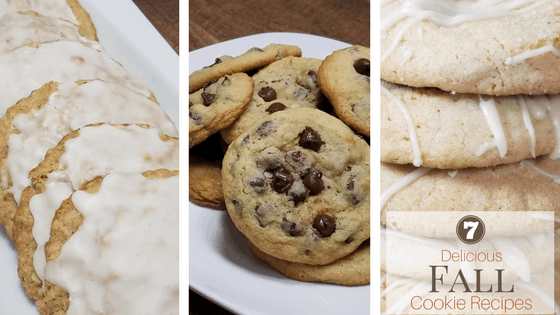 I’ve compiled this list of cookie recipes that are perfect for Fall. Autumn is the season for harvest and this recipe is perfect to make with all those extra apples you accumulate. They’re delicious, too! Oatmeal and chocolate chips? Yum! These were the favorite at my husband’s office and went flying out of the box! These cookies are now my husbands favorite cookie. This cookie has the wonderful taste of real maple syrup and biting into this cookie reminds you of Fall. The flavors in this cookie compliment each other in in the recipe and every bite is full of butterscotch! This recipe has been handed down many generations in my family and has always been a favorite in our home. The picture speaks for itself! Enjoy these recipes? Check out my fudge recipes that are perfect for gift giving! Yummy! These cookies look super delicious, especially the Mama’s Monster cookie recipe! I must try these! They all sound so good! I’m a sucker for a chewy oatmeal raisin though! I have been living your week of cookies! My favorite is still Chocolate Chip! Those Oatmeal Butterscotch cookies!! All of these looks so yummy. Fall baking is my favorite. ?